It's starting to feel GREAT outside as we make our way into Spring. One thing every Southern girl must have this time of year is a gorgeous wide brim hat. Whether it's for Carolina Cup, Easter Sunday, the Clemson Spring game or just lounging by the pool, a fun hat can definitely be put to good use. Today we have an exciting giveaway from Bloomin' Idiot designs, a Clemson alum owned business. 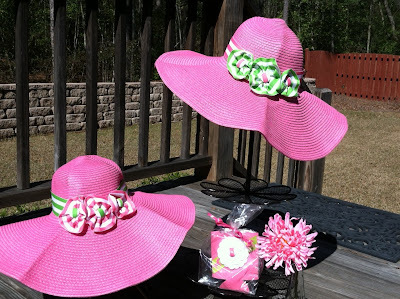 They would like to give one very lucky Clemson Girl one of their oh so pretty pink wide brimmed hats with their hand made gren and white rossettes. This hat screams Spring! 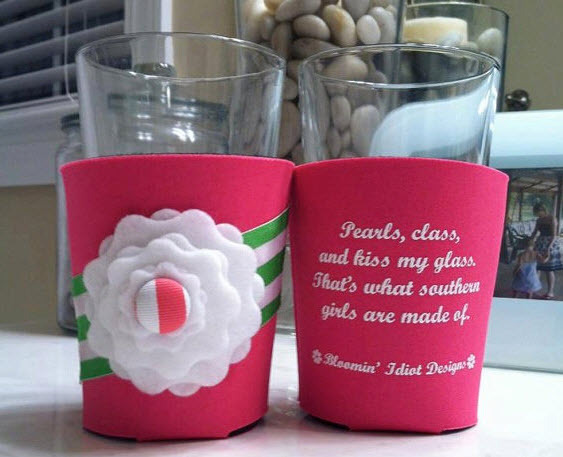 In addition to this lovely hat, the giveaway winner will also get a matching cute Southern girl koozie that fits solo cups. Check out the cute Southern girls' saying on the koozie - love it. Follow Bloomin’ Idiot Designs on Twitter and then tweet about this giveaway – include a link to this post and copy @scbloomidiot and @clemsongirl (1 entry). Deadline for all entries will be tonight, Wed. March 21st, at 7pm EST – we will randomly draw a winner and announce their name back on the blog around 8pm EST. The winner has 48 hours to claim their prize or we will draw a new winner. So don’t forget to come back and see if you’ve won so you don’t miss out on this amazing prize! Special thanks to Bloomin' Idiot designs for sponsoring such a fun giveaway. You can find these lovelys and more (including items in orange and purple) on Bloomin' Idiot designs Etsy shop. We are so excited Spring is finally here! Kathy M., Chapin, SC Well la de da....I can just see me wearing this drinking my southern drink. i LOVE bloomin' idiots' things!! !